Ischemic cerebellar infarction is a rare condition and accounts for between 1.5% and 20% of all ischemic strokes. It is common between the fifth and eighth decades of life, with men aged 60–65 being affected more often than women.,, The risk factors for cerebellar stroke are the same as for strokes in other areas of the brain, but clinical manifestations in the acute stage are very nonspecific. Subcortical white matter lesions (WMLs) on magnetic resonance imaging (MRI) in the healthy elderly are common. Its prevalence is estimated from 5% to 20% in several population-based trials.,, Increasing age and vascular risk factors such as hypertension (HT), diabetes are related to the degree of WMLs. 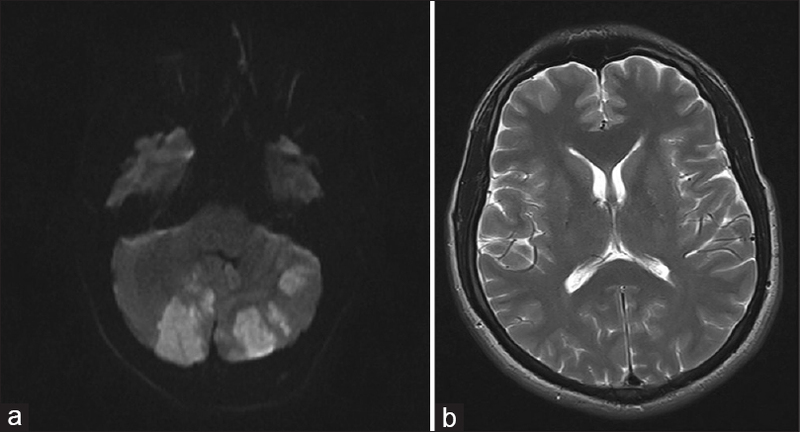 WMLs are associated with motor, cognitive, mood, urinary disturbances, and disability, but little is known about the prevalence of neurological signs in patients with these brain lesions. In addition, WMLs are proposed to be a strong predictor for persistency of clinical symptoms, they are significantly associated with age in patients with isolated cerebellar infarct. The relationship between WMLs and clinical symptomatology, functional condition is not known in patients with ACI, who have or do not have co-existing acute/chronic, supratentorial/infratentorial infarct. Therefore, we investigated the relationship between demographic characteristics, clinical symptomatology, etiological factors, functional condition, vascular distribution, frequency of WMLs, and concomitant lesion outside the cerebellum in patients with ACI at time of admission. We performed a retrospective analysis admitted to our Neurology Department with a diagnosis of acute ischemic stroke during an 8-year period (2007–2015). Within this patient group, we selected and analyzed the 68 patients with a radiological diagnosis of ACI, with or without involvement of other vascular territories of the central nervous system. 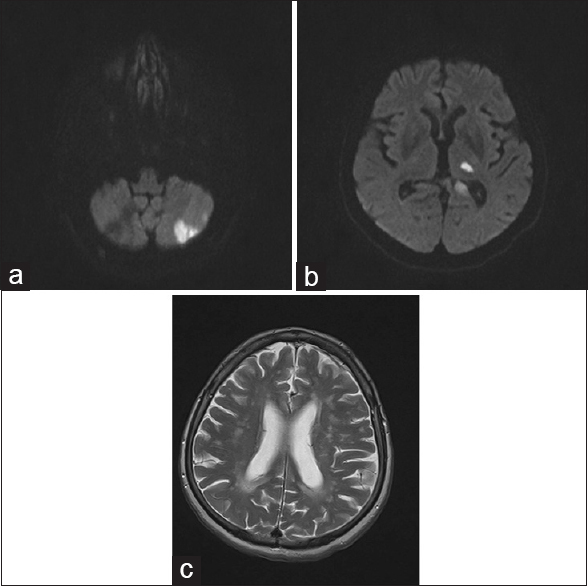 Patients were divided into three groups such as the ones with acute isolated cerebellar infarct (AICI) and without WMLs (Group 1) [Figure 1]a and [Figure 1]b; the ones who have AICI and WMLs (Group 2) [Figure 2]a and [Figure 2]b; and the patients who have acute/chronic, supratentorial/infratentorial vascular lesion in another area and WMLs in addition to ACI (Group 3) [Figure 3]a,[Figure 3]b,[Figure 3]c. A general sociodemographic data, medical history, clinical symptoms, and clinical signs were collected in all patients. Stroke subtype was classified according to Trial of ORG 10172 in Acute Stroke Treatment criteria. The Neurological examinations to calculate modified Rankin Scale (mRS 1–5) and National Institutes of Health Stroke Scale (NIHSS) scores on admission were performed. 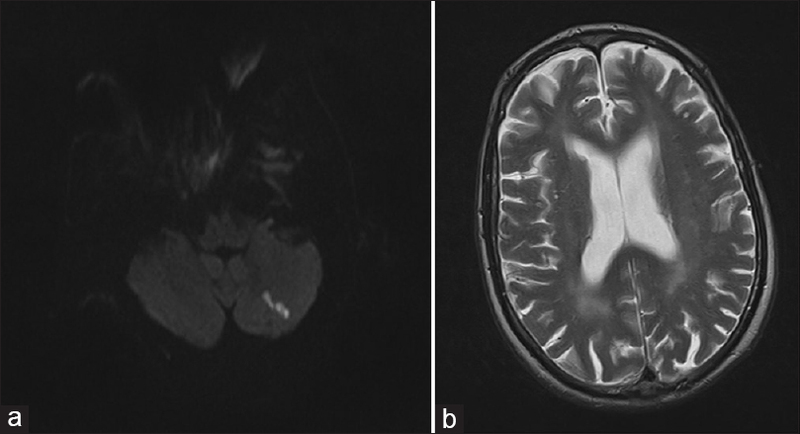 Radiological diagnosis was evaluated by brain MRI using a standard protocol, including the following sequences: T1, T2, diffusion-weighted imaging, and fluid attenuation inversion recovery. Radiological images with artifacts were excluded from the analysis of the affected vascular territories. The evaluation study was conducted with the participation of neurologists, a very experienced radiologist. Patients were grouped by affected territory using Amarenco's Diagrams  such as superior cerebellar artery (SCA), anterior inferior cerebellar artery (AICA), and posterior inferior cerebellar artery (PICA). Also, the MRI assessment included visual ratings of WMLs according to the Fazekas et al. 's scale. The study was performed in accordance with the Helsinki Declaration and approved by the Local Ethics Committee of the Necmettin Erbakan University, Meram Medical Faculty. Statistical analyses were performed with Statistical Package for the Social Sciences 16.0 for Windows (SPSS, Chicago, IL, USA). For comparisons between the study groups, t-test (for normally distributions) and Mann–Whitney U-test (for abnormal distributions) were used for continuous variables and χ2 test (for 3 or more × 2 variables) or Fisher's exact test (for 2 × 2 variables) for categorical variables. All significant levels were two-tailed and set at the level of 0.05. The mean age of the study sample (n = 59) was 65.24 ± 12.50 (range: 33–86) years. Patient group was composed of 34 (57.6%) males and 25 (42.4%) females. HT (n = 35, 59.3%), diabetes mellitus (n = 13, 22%), coronary artery disease (n = 13, 22%), hyperlipidemia (n = 10, 17%), and nonvalvular atrial fibrillation (NVAF) (n = 8, 13.5%) were the most common diseases. The patients were detected to have been used antihypertensive (n = 29, 49.2%), acetylsalicylic acid (n = 12, 20.3%), oral anticoagulant (n = 9, 15.3%), oral antidiabetic (n = 8, 13.6%), insulin (n = 6, 10.2%), antilipemic (n = 8, 13.6%), clopidogrel (n = 3, 5.1%), and cigarette (n = 5, 8.5%) before ACI. There was the history of a previous cerebrovascular event (n = 7, 11.8%), neoplasia (n = 5, 8.4%) (prostate cancer in two patients, breast cancer in two female patients and larynx carcinoma in one male patient) [Table 1]. 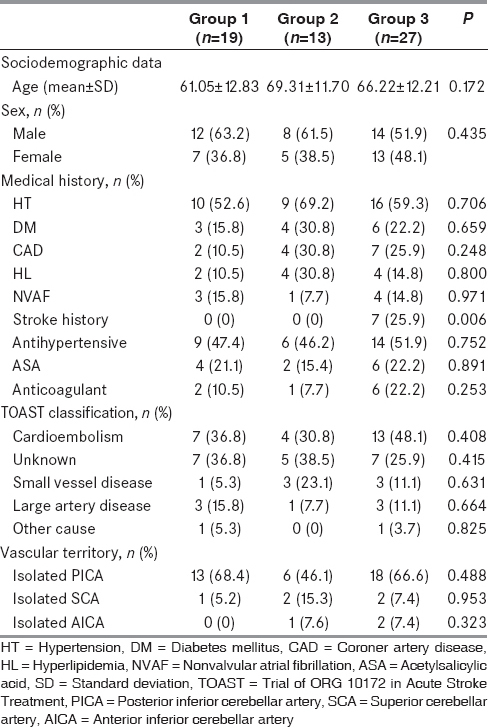 As shown in [Table 1], patients with cerebellar infarct (n = 24, 40.7%) were classified as cardioembolic (n = 19, 32.2%), unknown (n = 7, 11.9%), small vessel disease (n = 7, 11.9%), and large artery disease (n = 2, 3.4%), other cause etiology. When the study group was classified according to the frequency of isolated artery infarct area, isolated PICA (n = 37, 62.7%), isolated SCA (n = 5, 8.4%), isolated AICA (n = 3, 5%), and multiple artery area (n = 14, 23.7%) were found to be the affected areas. PICA + AICA involvement was detected in two patients and PICA + SCA involvement was detected in three patients in Group 1; PICA + AICA involvement was detected in three patients and PICA + SCA involvement was detected in one patients in Group 2; PICA + SCA involvement was detected in three patients, AICA + SCA involvement was detected in one patient, PICA + AICA + SCA involvement was detected in one patient in Group 3. There was no significant difference between the patient groups in terms of etiological classification and vascular territory. In Group 3, frontal region infarct accompanying to ACI was detected in 5 (18.5%) patients (3 were new-acute), temporal region infarct was detected in 3 (11.1%) (all were new-acute), parietal region infarct in 11 (40.7%) (9 were new-acute), occipital region infarct in 20 (74.1%) (14 were new-acute), thalamic region infarct in 5 (18.5%) (4 were new-acute), basal ganglion region infarct in 3 (11.1%) (2 were new-acute), and brain stem infarct was detected in 5 (18.5%) (3 were new-acute). For the study group, while mean NIHSS was 2.08 ± 1.67 on admission, mRS on admission was detected to be mRS1 (n: 44, 74.5%) and mRS2 (n: 12, 20.3%) most. Of the patients in Groups 2 and 3, 14 (35%) were in Fazekas stage 0, 11 (27.5%) were in Fazekas stage 1, 6 (15%) were in Fazekas stage 2, and 9 (22.5%) were in Fazekas stage 3 [Table 2]. Imbalance (n = 47, 79.7%), vertigo (n = 46, 78%), nausea-vomiting (n = 23, 39%), dysarthria (n = 15, 25.4%), and weakness (n = 13, 22%) were the most common clinical symptoms. 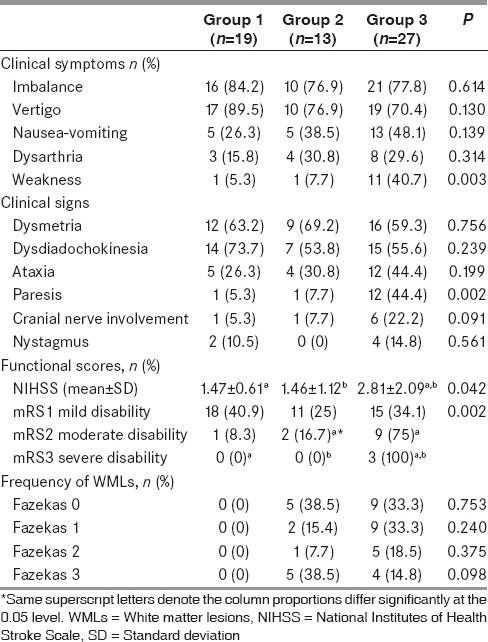 Dysmetria (n = 37, 62.7%), dysdiadochokinesia (n = 36, 61%), ataxia (n = 21, 35.6%), cranial nerve involvement (n = 8, 13.6%), and nystagmus (n = 6, 10.2%) were the most common clinical examination findings [Table 2]. Antihypertensive, acetylsalicylic acid, and anticoagulants were the most commonly used drugs before ACI. Oral anticoagulant use was more prominent in Group 3 (n: 6, 22.2%). This result may be explained with the high ratios of cardioembolic events and NVAF in the same group. In addition, history of a previous stroke was detected as 7 (25.9%) in Group 3. When we analyzed oral anticoagulant use and history of a previous stroke with regard to proportional frequency in Group 3, we may conclude that it may be associated with the high ratio of cardioembolic events. In our study group, cardioembolic etiology was the most common. Cardioembolic etiology (n: 14) was in the foreground in patients with isolated PICA infarct (n: 37). Also, in Group 3, the patients with isolated PICA infarct (n: 18, 66.6%) composed almost two-third of the group. This result has put cardioembolic etiology in the foreground both in the whole study group, in Group 3, and in the isolated PICA infarct group. Although our data reflect the results of a small patient group, it reveals the need for pulling attention to etiologic screening and preliminary treatments, considering the scarce of data in literature. There are limited, various data about the ratios of coexisting infarcts detected in the other artery areas in patient groups where ACI was detected ,, and subgroup analyses of these data were not done. In addition, we could not encounter data about coexisting infarct areas in the other cerebral artery areas. Occipital and parietal infarcts accompanying ACI were detected to be the most frequent in our case Group 3. New-acute onset occipital infarcts coexisted with ACI in half of the case group (n: 14/27). While the etiologic factor was cardioembolic event in 8 of 14 patients, the cerebellar lesion was in isolated PICA area in 6 patients. Current data may suggest that particularly cardiac etiology should be kept in mind in the presence of the coexisting vascular area infarcts in ACI patients in whom isolated PICA area infarct was detected. A statistically significant difference was detected between groups with regard to NIHSS on admission (P: 0.042). Mean NIHSS values on admission were significantly higher in Group 3 compared to the other group. In addition, the difference between groups with regard to mRS on admission was more evident in Group 3 and the difference was statistically significant (P: 0.002). When evaluated with regard to NIHSS, while mild neurologic deficit was detected in patients in Groups 1 and 2, mild-to-moderate neurologic deficit was detected in Group 3. With regard to mRS, while mild neurologic deficit was detected in 90% of the patients in Groups 1 and 2, moderate-to-severe neurologic deficit was detected in nearly half of the patients in Group 3. We consider that this has resulted from the characteristics of lesion load in Group 3. A statistically significant difference was not detected between Groups 2 and 3 with regard to WMLs frequency. Limited data are available about the relationship between WMLs load and cerebellar infarct, and this study proposes the presence of a correlation between WMLs load and functional scores as associated with age and also WMLs may be a strong predictor for persistency of clinical symptoms. Primarily, we want to emphasize that our study group is homogenous with regard to age. Our data have revealed that the patients in Group 3 are different from the patients particularly in Group 2 with regard to mRS2 and mRS3. However, this result does not enable us to associate the disease burden reflected to functional scores with only WMLs when it is evaluated together with all evaluable statistical data. In fact, it is quite difficult to make a comment about this issue which is affected from many variables such as lesion load ratio, neurologic deficit severity, clinical symptomatology, and etiologic factor. However, we consider that both study groups being well documented with regard to medical history, acute/chronic infarct characteristics accompanying to ACI, and homogenous relationship between groups should be considered when evaluating our data. The most common clinical symptoms and the most common clinical examination findings on admission are similar with those of previous studies.,,, Weakness as a clinical symptom and paresis as a clinical finding were more evident in Group 3. This prominency which we considered to be directly associated with lesion burden of patient population consisting Group 3 has led to statistical significance (P: 0.003/0.002). It seems quite difficult to make an interpretation about whether and how this result was affected from WMLs in Group 3 due to the above-mentioned variables. In addition, current data were obtained at the time of admission and absence of longitudinal follow-up of data made to explain this issue difficult. Although it is quite difficult to detect the relationship between WMLs and severity of neurologic function, timely detection and modulation of risk factors may be associated with prevention or treatability of WMLs, and this may be one of the important points to prevent stroke-related disability. Despite the presence of data about ischemic diseases of cerebellum and their clinical findings, insufficient number of patients in previous studies, absence of longitudinally recorded data of radiologic lesion load and clinical data and thereby not making a correlation between them, and using the data of single-center studies with unsimilar methodology indicate that this issue is untouched. The mentioned limitations are valid for our study also. Performing multicenter, prospective studies with similar methodology would provide significant data about better understanding of the ischemic diseases of cerebellum, creating different treatment modalities, fighting with the complications, and mortality and morbidity of the disease. Tohgi H, Takahashi S, Chiba K, Hirata Y. Cerebellar infarction. Clinical and neuroimaging analysis in 293 patients. The Tohoku Cerebellar Infarction Study Group. Stroke 1993;24:1697-701. Hong JM, Bang OY, Chung CS, Joo IS, Huh K. Frequency and clinical significance of acute bilateral cerebellar infarcts. Cerebrovasc Dis 2008;26:541-8. Merwick Á, Werring D. Posterior circulation ischaemic stroke. BMJ 2014;348:g3175. Fazekas F, Niederkorn K, Schmidt R, Offenbacher H, Horner S, Bertha G, et al. White matter signal abnormalities in normal individuals: Correlation with carotid ultrasonography, cerebral blood flow measurements, and cerebrovascular risk factors. Stroke 1988;19:1285-8. Longstreth WT Jr., Manolio TA, Arnold A, Burke GL, Bryan N, Jungreis CA, et al. Clinical correlates of white matter findings on cranial magnetic resonance imaging of 3301 elderly people. The Cardiovascular Health Study. Stroke 1996;27:1274-82. Barkhof F, Scheltens P. Imaging of white matter lesions. Cerebrovasc Dis 2002;13 Suppl 2:21-30. Taylor WD, MacFall JR, Provenzale JM, Payne ME, McQuoid DR, Steffens DC, et al. Serial MR imaging of volumes of hyperintense white matter lesions in elderly patients: Correlation with vascular risk factors. AJR Am J Roentgenol 2003;181:571-6. Poggesi A, Gouw A, van der Flier W, Pracucci G, Chabriat H, Erkinjuntti T, et al. Cerebral white matter changes are associated with abnormalities on neurological examination in non-disabled elderly: The LADIS study. J Neurol 2013;260:1014-21. Grips E, Sedlaczek O, Bäzner H, Fritzinger M, Daffertshofer M, Hennerici M. Supratentorial age-related white matter changes predict outcome in cerebellar stroke. Stroke 2005;36:1988-93. Amarenco P, Lévy C, Cohen A, Touboul PJ, Roullet E, Bousser MG. Causes and mechanisms of territorial and nonterritorial cerebellar infarcts in 115 consecutive patients. Stroke 1994;25:105-12. Fazekas F, Chawluk JB, Alavi A, Hurtig HI, Zimmerman RA. MR signal abnormalities at 1.5 T in Alzheimer's dementia and normal aging. AJR Am J Roentgenol 1987;149:351-6. Kase CS, Norrving B, Levine SR, Babikian VL, Chodosh EH, Wolf PA, et al. Cerebellar infarction. Clinical and anatomic observations in 66 cases. Stroke 1993;24:76-83. Savitz SI, Caplan LR, Edlow JA. Pitfalls in the diagnosis of cerebellar infarction. Acad Emerg Med 2007;14:63-8. Bogousslavsky J, Regli F, Maeder P, Meuli R, Nader J. The etiology of posterior circulation infarcts: A prospective study using magnetic resonance imaging and magnetic resonance angiography. Neurology 1993;43:1528-33. Cano LM, Cardona P, Quesada H, Mora P, Rubio F. Cerebellar infarction: Prognosis and complications of vascular territories. Neurologia 2012;27:330-5. Wang PQ, Ding ZG, Zhang GB, Wang Y, Liu JZ. A study on lesion pattern of bilateral cerebellar infarct. Eur Rev Med Pharmacol Sci 2015;19:1845-51. Aluçlu MU, Yücel Y. Etiology, Localization and Prognosis in Cerebellar Infarctions. Dicle Tıp Derg 2006;33;31-5. Macdonell RA, Kalnins RM, Donnan GA. Cerebellar infarction: Natural history, prognosis, and pathology. Stroke 1987;18:849-55.